Share this product and receive a $6.70 sharing discount. This very unique handcast cross is made from .925 silver. The cross is called a Vine Cross because of the delicate way the silver threading has been wrapped around the cross... much like that of a vine. The Vine Cross measures 2 1/2" in length and 1 1/2" in width. 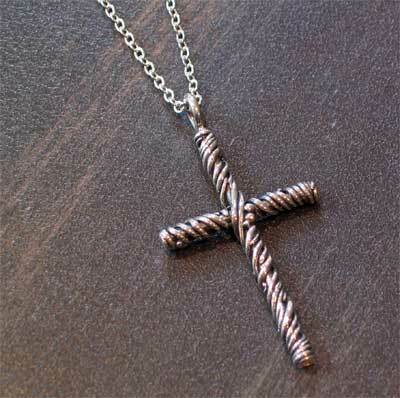 The cross has been strung on an adjustable silver small flat cable chain. Adjusts from 16" to 18". South African, Ashleigh George has been designing unique and creative jewelry from a very young age. The pieces that we carry are from her Dove Collection which are inspired by the richness of Scripture along with the beautiful and intricate patterns found in nature. She hopes that the wearer will be inspired and reminded of the true Word of God, and that they will find comfort and strength that these wearable treasures hold.